This June will be the fifth exhibition Senavirathna has staged with Paradise Road Galeries. Senavirathna was born in Kandy and graduated from the University of Visual and Performing Arts in 2008. 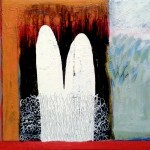 One year prior to this his work was featured in a group show at the Noble Sage art gallery in London; he continues to be represented by the Noble Sage in London to-date. A recital by pianist Kausikan Rajeshkumar, award winner of the Martin Musical Scholarship Fund. 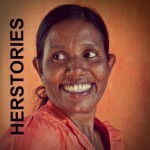 ‘Herstories’ will be on in Colombo on April 6 and 7 at the Harold Peiris Gallery, Lionel Wendt, in Ampara from April 20-21 at the Christa Illam Hall, Kalmunai and in Galle on April 27 -28 at an as yet undecided venue. 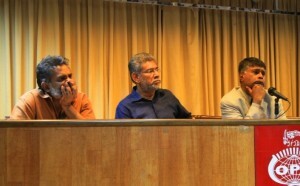 Collaborators on the project include the organisation Viluthu, Sharni Jayawardena and November Productions. Events: Devolution, Decentralization, Accountability, Consultation? This year the Gratiaen Prize, in affiliation with the Standard Chartered Bank, celebrates 20 years. Reflecting this landmark in the prize’s career the shortlist announcement is scheduled as the inaugural event for Standard Chartered Colomboscope 2013 on 22 March at the Chequerboard, Park Street Mews at 6.15 pm. An exhibition of Seevali Illangasinghe‘s paintings will be held at the Visual Arts University, (UDA Perera gallery), No 46, Horton Place Colombo 7, March 11-18, from 9.00 A.M to 5.oopm. 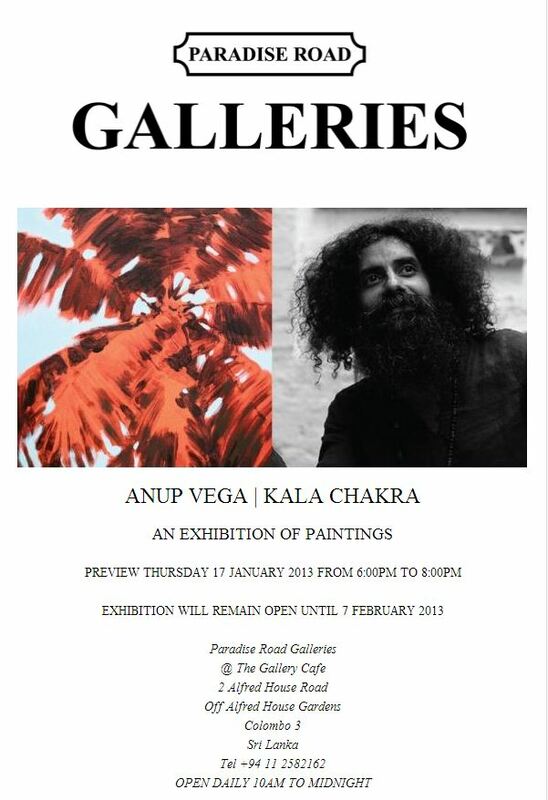 The exhibition will be his latest collection of paintings. Being an eminent visual artist for over four decades, Seevali Illangasinghe has been marking one aspects of art in Sri Lanka’s art history and has exhibited his paintings in many capitols of the world. The exhibition ‘Sri Lankan Contemporary Art & Design’ will showcase a selection of leading contemporary artists and emerging designers. The exhibition presents the concept behind the new space, that will continue to feature capsule collections by selected local designers to compliment the cutting edge works by artists represented by Saskia Fernando Gallery. Along with work by artists Saskia Pintelon, Jagath Weerasinghe, Jagath Ravindra, Mika Tennekoon and Kingsley Gunatillake; this exhibition features furniture, design Jewellery and socks, all locally designed and produced. 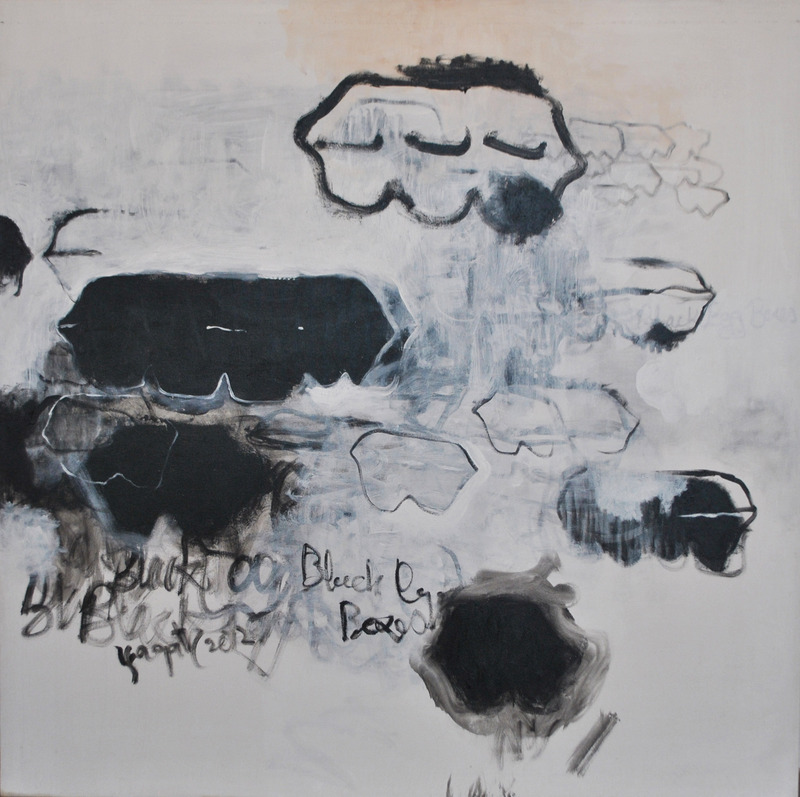 ‘Sri Lankan Contemporary Art & Design’ will open on Saturday 9 March at 4pm and remain open until 10 April 2013. 2, Kynsey Terrace, Colombo 8. The changing role of Parliamentarians, given the demands of functioning in both a legislative and an executive role. The fourth discussion in the series will be on March 6th on ‘Freedom of Information’. The Author’s Forum is pleased to welcome Sri Lankan performance artists and activists Sivamohan Sumathy and YaliniDream for conversation with V.V. Ganeshananthan plus performance. Sivamohan Sumathy holds a doctorate from the Washington State University. A senior lecturer in English at the University of Peradeniya, Sri Lanka, she has published and presented on postcolonial literature and theory, women’s movements in Sri Lanka, and performing arts.YaliniDream is one of the South Asian diaspora’s most prominent performance poets, and has toured nationally at hundreds of spaces throughout the U.S. as well as Europe & South Asia. V.V. Ganeshananthan is the Zell Visiting Professor of Creative Writing at the University of Michigan. The Author’s Forum is a collaboration between the U-M Institute for the Humanities, University Library, Great Lakes Literary Arts Center, & Ann Arbor Book Festival. 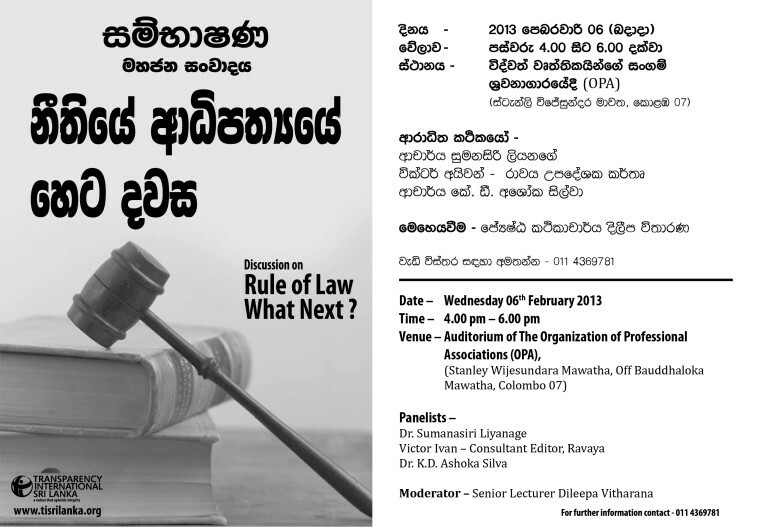 ‘Sambhashana’ panel discussion organised by Transparency International Sri Lanka (TISL)will take place at the auditorium of the Organization of Professional Associations (OPA), Stanley Wijesundera Mawatha, Colombo 7 on Wednesday 06th February 2013 at 4p.m. Given the recent surge of extremist ethno-religious discourse in various quarters, and aggressive anti-Muslim propaganda in particular, the prospects of a sustainable peace and a united Sri Lanka seem in jeopardy. The discussion will examine what lessons we have learned and should have learned from a thirty years war and the exploitation of passions on all sides that precipitated this. 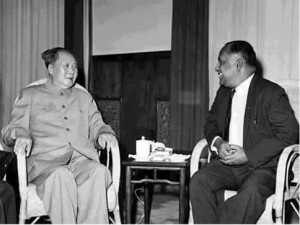 It will consider how we might arrive at sense of Sri Lankan nationhood, while considering what it means to be a Sri Lankan citizen possessed of inalienable freedoms and equality of rights? The discussion will range beyond constitutional reform to look at institutional and structural frameworks necessary to ensure democracy and pluralistic development. The third discussion in the series will be on February 20th, on ‘Electoral Reform and the role of Parliamentarians’. 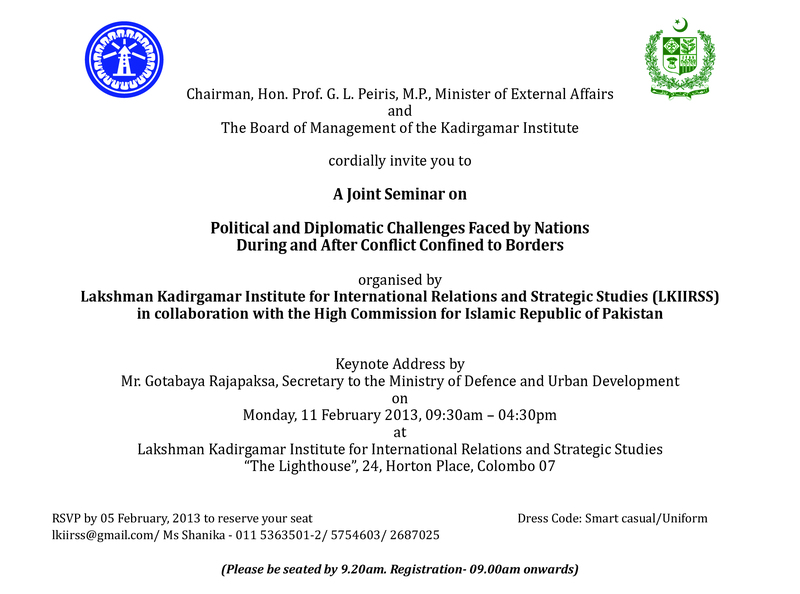 Please RSVP with the Kadirgamar Institute with full details (full name, designation, organization, and participating sessions) by 5th February, 2013 to reserve your seat. 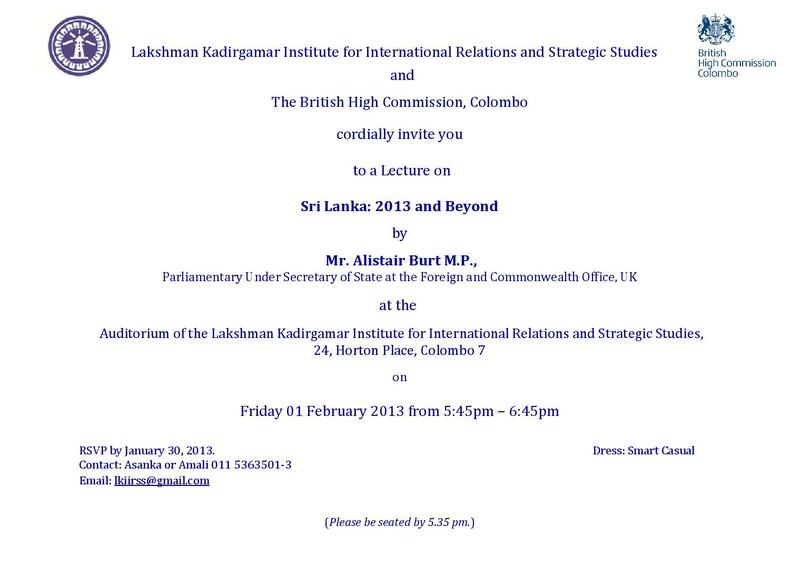 Lakshman Kadirgamar Institute for International Relations and Strategic Studies (LKIIRSS) in collaboration with the British High Commission, Colombo are organizing a lecture on Sri Lanka: 2013 and Beyond. It is the first public lecture organized by the institute and the speaker is Alistair Burt, the Parliamentary Under Secretary of State at the Foreign and Commonwealth Office, UK. Mr. Burt oversees Afghanistan, Pakistan, Sri Lanka, Bangladesh and Maldives, Counter Terrorism, Counter Proliferation, North America, Middle East and North Africa in the UK Foreign Office. 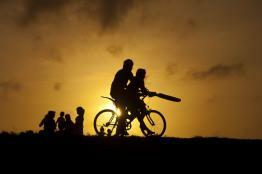 The event will take place on February 01, 2013 from 5.45 pm onwards at the auditorium of the Lakshman Kadirgamar Institute. 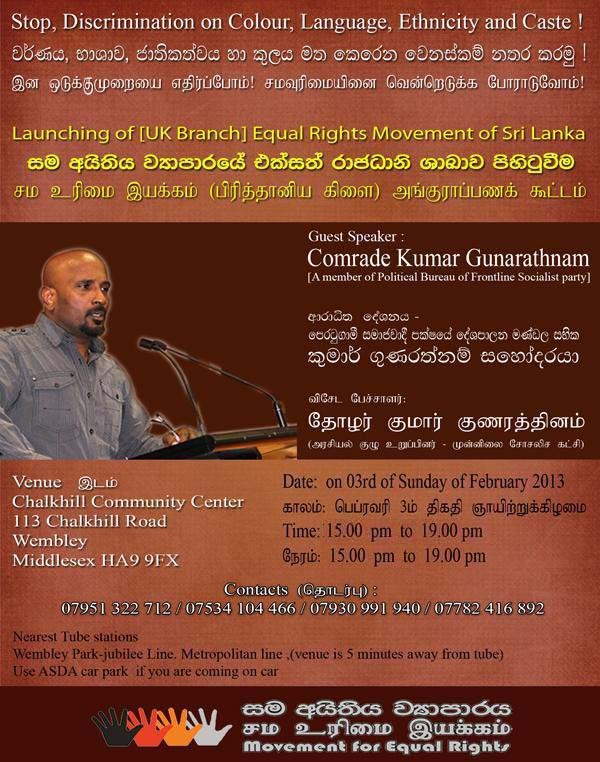 Events: Stop Discrimination On Colour, Language, Ethnicity And Caste! Stop discrimination on colour, language, ethnicity and caste!